Beautiful day, typically, now I´m back at work. Went straight from work into the allotment and got digging. The main top plot is all dug now, apart from underneath the marrows, which I may just whip out next time as they're never going to grow anything else! One of the broccolis has finally got a head forming :-) and the caulis are catching up… must risk sybol there to stop the caterpillars. Started weeding and digging the second bed, and dug a few more clods of grass out of the path. Bent the poor fork again - must take up the new one. Made potato and leek soup for tea, from my own veg. I like this lark. More furtling about the allotment. Hoiked out the marrow plants, so I could finish digging and raking the top plot around the remaining brassicas. The sample onion sets arrived today, so planted them next to the broccoli. Wrong location, but they're only going to be there until June anyway, and there's only a few (28). Another reasonably dry day and so risked going to the allot and digging a bit more of the carrot bed. Have now done a whole 2 square yards of what seems to be solid speedwell. Beds are getting dug all over the place now, and so I'm glad I've managed to get one looking respectable at least!!! Few more carrots pulled, and the stumpier/smaller bits went into a carrot and coriander soup for tea. Chatted to Jim for a while and was amazed at how close one of the local robins would get to his feet (inches). Gave up my principles and sprayed the caulis and broccoli with Sybol, on the grounds that otherwise I wouldn't get to eat any… but at least I am only doing the one spray, with a reasonably safe one (you can eat the same day if necessary). Two cauliflowers are now over 4". The broccoli is still tiny. Finally remembered to pick a couple of blackcurrant leaves. Yes I think they have reversion disease, but since it stops them cropping as heavily as they could, and I couldn't pick all of this years' as it was, I'm not too bothered! Went digging yet again, as it was a really nice evening. Vincent gave me a clump of spring cabbages to spur me on in getting the cabbage bed sorted out! Dug another couple of square yards of weed out. I'm getting there (I think!). Got up to the allot slightly later than hoped and wound up planting all of Vincent's spring cabbages and all the onions. The latter were mostly done in almost dark thanks to having to dig in a tub of chicken pellets first, and I still have no idea if I've planted them the right way up! So I have 23 cabbages at the firebox end of the bed, and 99 (!) onions where the leeks should have gone, as there are still caulis and cabbages where the onions were planned. Cut two caulis, one merrily flowering (they go purple!) and the other 6" across and a very respectable meal. Didn't do any more digging, as the planting took a while. 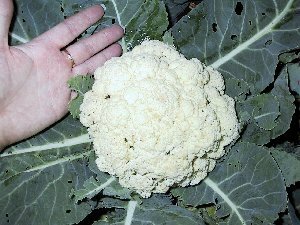 Ate the cauliflower. This time was more prepared and went up straight after work. Was supposed to be a really nice day but it wasn't by teatime! Few drops of rain as I got out of the car, so wasn't sure if I'd be able to do much. Fortunately the downpour held off until I was safely home. 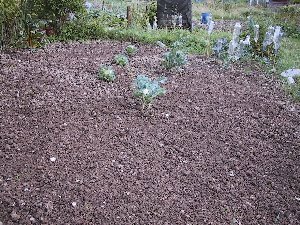 In the meantime, managed to weed and dig the rest of the old carrot and beet plot (hoorah) and made a start on where the potatoes had been on the other side of the leeks. Really ought to pull up the lettuces and weed between the remaining leeks, which are going to be there for the winter (best place to store them). Now all the autumn plantings are in, much to my amazement. The French beans are still going, even more amazingly, and so may well give me a final present of seed. Broccoli doing very nicely now. Largest head is about 1½" across and the side ones are growing too, so if the frost manages to keep off for another couple of weeks it should be edible by then. But then broccoli is hardy, like caulis, so should be fine anyway. Went up to allotment to have a peek, since I was feeling too ill to do anything and the rain has been too frequent as of late in any case. The onions are growing. The cabbages are … sort-of growing (I think something's been nibbling at them). Rescued some apple windfalls and was gratifed to see the leading broccoli has got a nice head on (and the rest are starting to grow them). And another cauli has got a golfball sized curd growing. Leeks still the same - growing gradually bigger. Still no sign of the first frost, which I'm glad about for the broccoli's sake! Though it has been the warmest October for 340 years. Since it hit 23oC on the day of the Treasure Hunt, I'm not surprised. But the first frost was November last year too.